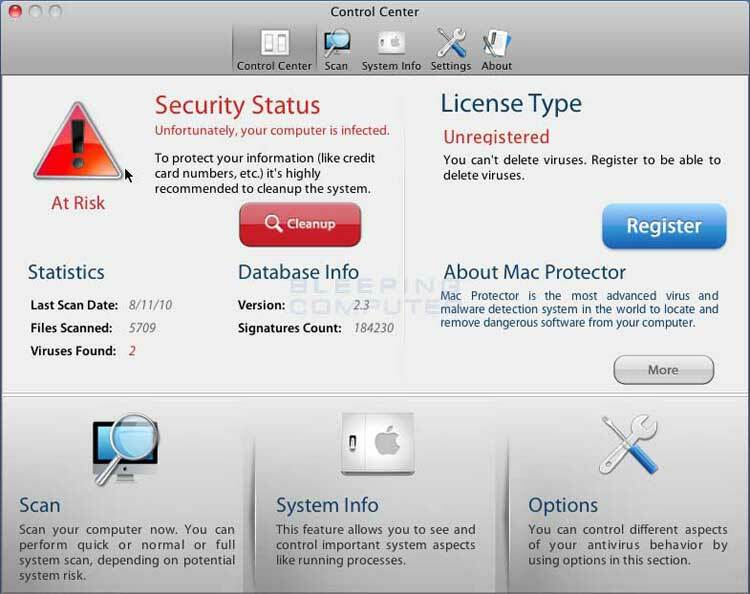 Mac Protector is a fake rogue anti-spyware program that for the Mac OS operating system. This infection is spread through the use of advertisements on web sites that pretend to be fake online scanners. When these fake scans are finished, it will state that your computer is infected and then automatically download the Mac Protector program onto your computer. Once the program has finished downloading, the installer will start and prompt you to install the program. Once the program is installed it will be configured to start up automatically when you login to your Mac. Once running it will pretend to scan your computer and then state that there are numerous files on your computer that are infected. If you attempt to clean these fake infections, though, the program will state that you must first purchase a license before it will allow you to do so. After the scan the Control Center screen for Mac Protector will be updated to state that your computer is infected and at Risk. Regardless of the information presented by this program, you should not purchase this program as all of this information is false. Unfortunately, when Mac Protector is installed on your computer it will also be added to your accounts Login Items so that the program is launched every time you login to your Mac. As there is no Dock icon for this application, it is also not easily closed and will instead require you to terminate its process through the Activity Monitor before you are able to remove the application from your computer.